A large coronal mass ejection that occurred in July 2012 and just missed the Earth. A coronal mass ejection (often abbreviated to CME) is a large outburst of plasma from the solar corona, the outermost layer of the Sun. These travel radially outwards from the Sun at speeds ranging from 250-3,000 km/s. Coronal mass ejections can contain billions of tons of material and also possess an internal magnetic field. CMEs can be responsible for geomagnetic storms on Earth, which disturb the Earth's own magnetic field and may damage electronics. The first observations of a CME were made using the OSO 7 satellite between 1971 and 1973. The satellite utilised a coronagraph, a circular disk that blocks the bright light emanating from the Sun. This allows the much fainter solar corona and also CMEs to be observed. Coronal mass ejections are believed to be formed when the Sun's magnetic field suddenly reconfigures itself. High energy CMEs occur when the magnetic field lines in the Sun's corona become twisted and contorted. At some point the field becomes too stressed and this tension is released in a process called magnetic reconnection, where the field realigns. Sometimes there is a release of electromagnetic energy in the form of a solar flare, followed by a burst of plasma. This plasma is the coronal mass ejection. Such ejections often occur where the magnetic field of the Sun is strong, such as near sunspots. Alternatively, CMEs may be produced where comparatively cool but dense plasma is trapped by magnetic fields in the inner corona, known as solar filaments or prominences. Sometimes this material will be simply reabsorbed into the solar surface when the magnetic fields reconfigure, but if not a CME may be generated. CMEs are truly vast phenomena, with mass of 1015 grams (billions of tons).. Travelling at 250-3,000 km/s a CMR may reach the Earth in anywhere from 15-18 hours to several days. As they travel outwards, the material that the ejection is composed of expands. When it reaches 1 AU from the Sun, it may be as large as 0.25 AU; a quarter of the distance between the Earth and the Sun. If an ejection is directed towards the Earth, it will generally result in a geomagnetic storm as well as vivid and very intense aurora. The energy of the CME can be transferred efficiently to the Earth by magnetic reconnection, the same process that originally generated the ejection. ↑ Fierce solar magnetic storm barely missed Earth in 2012. Retrieved on 2019-03-06. 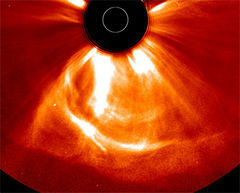 ↑ 2.0 2.1 2.2 2.3 Coronal mass ejection. Retrieved on 2019-01-04. ↑ 3.0 3.1 3.2 3.3 CORONAL MASS EJECTIONS. Retrieved on 2019-01-5. ↑ 4.0 4.1 What is a coronal mass ejection?. Retrieved on 2019-01-05. This page was last modified on 6 March 2019, at 10:16.